It has been more than 20 years since the last Wonder Boy game was released, but the spirit of the game lives on in Monster Boy and the Cursed Kingdom. The game is being created by mobile developers FDG Entertainment and Game Atelier in partnership with Wonder Boy series creator Ryuichi Nishizawa. 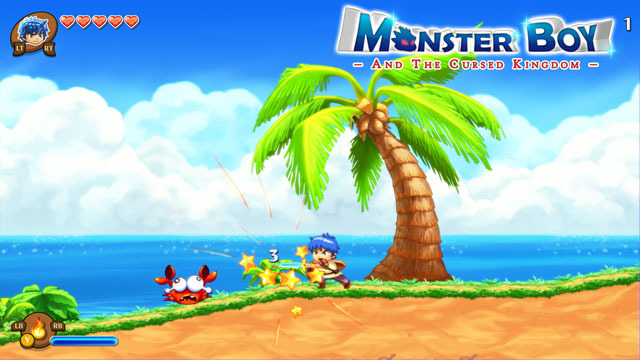 Monster Boy is able to transform into five different animals, each with their own abilities, allowing him to traverse the world, access new paths, and fight his way through baddies and bosses. The new game is getting the HD treatment with colorful high quality sprites as seen in Wonder Boy: The Dragon's Trap. The game is now available on PS4 via PSN, Xbox One via Microsoft Store, and Switch via eShop, with physical releases also available for PS4 and Switch. The game will be arriving early next year on PC.